The most beautiful example of Blaeu's map of the Kremlin, Moscow, Russia. КРЕМЛЁН ГРАД. / Kremlenagrad, Castellum Urbis Moskvæ. 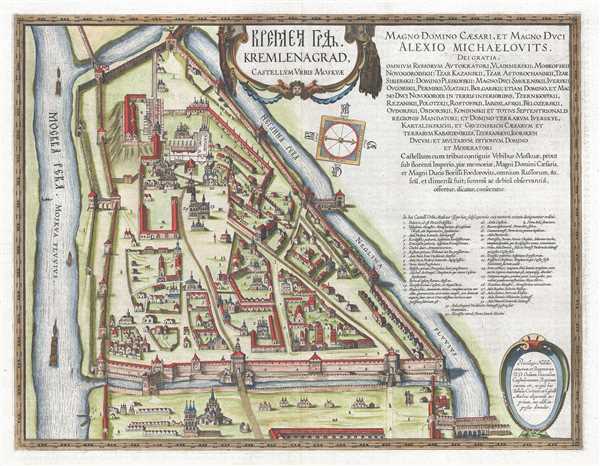 This is a 1642 Hessel Gerritsz map of the Kremlin in Moscow, Russia. Looking toward the southwest, the map depicts the fortress from the Moscow River to the Neglinnaya River and from the confluence of the Neglinnaya River and the Moscow River to just outside the northwest wall of the Kremlin, what is today Red Square. The Moscow Kremlin is the most well-known of the Russian kremlins. A 'kremlin' is a 'fortress within a city'. Gerritsz illustrates individual buildings both inside and outside the Kremlin walls and numerically identifies thirty-two different locations within the Kremlin. The numbers correspond with an index situated along the right border. Bridges, buildings, and gates in the walls are among the identified locations. Boats and barges are illustrated ferrying goods on the Moscow River. It is commonly believed that this map was not published in a Blaeu atlas until 1662, though earlier editions of Gerritz's Kremlenagrad map are known to have been published in Braun and Hogenburg's Civitates orbis terrarium. When we obtained the present example, the seller claimed that it was extracted from a 1642 Dutch edition of Blaeu's atlas, which would be an edition of Blaeu's Tooneel des Aerdrycks. Through our research, we have concluded that it is undeterminable exactly from which atlas this example was extracted; it could have been printed in a 1642 edition of Blaeu's Tooneel des Aerdrycks or in a 1662 edition of Blaeu's Atlas Maior. As a side note, this is the most beautiful example of this map we have seen to date or could imagine and, for the discriminating collector, this is the one to buy.